The purpose of verification is to ensure the accuracy of all student information. This includes program and course information, as well as personal information such as mailing and home addresses. Students are responsible for ensuring that all information on their record is accurate. All graduating students must see a departmental advisor at this time to verify that all the program requirements have been met. A helpful Minerva tool to use in this process is Degree Evaluation. Any questions or problems with your record should be reported to the Student Affairs Office. Applied for graduation upon registration in the final term on MINERVA. Only those students in their last two(2) semesters will be coded as a Year 3 and eligible to apply for graduation on MINERVA. If you are unable to apply for graduation, contact the Student Affairs Office immediately. Graduation term of Fall 2018 (February 2019) if all courses are completed and graded by December 2018. Graduation term of Winter 2019 (June 2019) if all courses are completed and graded by April 2019. Graduation term of Summer 2019 (November 2019) if all courses are completed and graded by August 2019. Verify eligibility for graduation with a departmental advisor ensuring all program requirements will be met by graduation time. Achieve a minimum CGPA 2.00. Verify that graduation term is indicated on your unofficial transcript. If taking courses outside McGill to satisfy degree requirements, ensure an official transcript is sent from the HOST University to the Engineering Student Affairs Office. The following deadlines must be respected: - January 15th for Fall Term graduation. - May 5th for Winter Term graduation; - September 1st for Summer Term graduation. This form displays your Graduation record at McGill during the graduation approval process, and will indicate if you have been approved by your Faculty for graduation. The Graduation Approval Query form will be made available to graduating students approximately 2 weeks after exams have ended. Student may view the query by logging in to Minerva, selecting the Student menu, then the Student Records menu and clicking on the Graduation Approval Query link at the bottom of the page. For more information, please go to www.mcgill.ca/students/graduation/. Degree Evaluation is an on-line tool to help students and their advisers compare the student's academic record to the requirements of a specific program so they can review what’s been completed and what remains to be completed in a student’s program. Degree Evaluation is intended to be an advising tool and is not a substitute for a manual review of a student’s record with their departmental advisor. Further information can be found at Degree Evaluation. If you have any questions, concerns or comments regarding this tool or your Degree Evaluation, please contact us at information [at] engineering.mcgill.ca or visit the Engineering Student Affairs Office, located in room 22, Frank Dawson Adams Building. you are in the top 10% of the faculty's graduating class of students; this calculation is based on the CGPA. this designation may be withdrawn if your CGPA at another university or in another faculty at McGill is not comparable to the CGPA earned in your graduating faculty. you are in the top 25%, but below the top 10%, of your faculty's graduating class of students; this calculation is based on the CGPA. Information pertaining to the convocation ceremonies can be obtained from the McGill Secretariat convocation web site, and the Convocation website. Convocation ceremonies at McGill University are held at the end of May or first week of June, and in the fall. 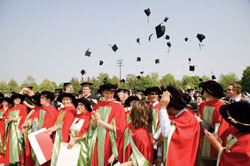 All graduating students in the Faculty of Engineering, their family and staff are invited to attend the annual Faculty of Engineering Convocation Reception to take place after the convocation ceremony on the lower field adjacent to the Convocation tent. The invitation is open to students who graduated in the Fall and Winter terms, and to students expecting to graduate in summer; however summer graduates attend the Convocation Ceremony held in the Fall (October).